A video discussing a field-based approach to silica monitoring. Monitoring could help reduce exposure to silica. 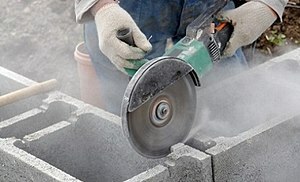 The best way to prevent silicosis is to identify work-place activities that produce respirable crystalline silica dust and then to eliminate or control the dust ("primary prevention"). Water spray is often used where dust emanates to control the kick up of silica dust. To avoid dust accumulating on clothing and skin, place your clothes in a seal-able bag and, if possible, shower once returning home. When dust starts accumulating around a workplace, utilize an industrial vacuum to contain and transport dust to a safe location. Dust can also be controlled through personal dry air filtering. ^ Jane A. Plant; Nick Voulvoulis; K. Vala Ragnarsdottir (13 March 2012). Pollutants, Human Health and the Environment: A Risk Based Approach. John Wiley & Sons. p. 273. ISBN 978-0-470-74261-7. Archived from the original on 31 December 2013. Retrieved 24 August 2012. ^ "Pneumonoultramicroscopicsilicovolcanoconiosis". Oxford Dictionaries. Oxford University Press. Retrieved 2017-10-10. ^ United States Bureau of Mines, "Bulletin: Volumes 476–478", U.S. G.P.O., (1995), p 63. ^ Rosen G: The History of Miners' Diseases: A Medical and Social Interpretation. New York, Schuman, 1943, pp.459–476. ^ a b "Diseases associated with exposure to silica and nonfibrous silicate minerals. Silicosis and Silicate Disease Committee". Arch. Pathol. Lab. Med. 112 (7): 673–720. July 1988. PMID 2838005. ^ a b c "Silicosis Fact Sheet". World Health Organization. May 2000. Archived from the original on 2007-05-10. Retrieved 2007-05-29. ^ Cowie RL (November 1994). "The epidemiology of tuberculosis in gold miners with silicosis". Am. J. Respir. Crit. Care Med. 150 (5 Pt 1): 1460–2. doi:10.1164/ajrccm.150.5.7952577. PMID 7952577. ^ Pelucchi C, Pira E, Piolatto G, Coggiola M, Carta P, La Vecchia C (July 2006). "Occupational silica exposure and lung cancer risk: a review of epidemiological studies 1996–2005". Ann. Oncol. 17 (7): 1039–50. doi:10.1093/annonc/mdj125. PMID 16403810. Archived from the original on 2012-07-01. ^ Cassel SL, Eisenbarth SC, Iyer SS, et al. (June 2008). "The Nalp3 inflammasome is essential for the development of silicosis". Proc. Natl. Acad. Sci. U.S.A. 105 (26): 9035–40. doi:10.1073/pnas.0803933105. PMC 2449360. PMID 18577586. ^ a b Wagner, GR (May 1997). "Asbestosis and silicosis". Lancet. 349 (9061): 1311–1315. doi:10.1016/S0140-6736(96)07336-9. PMID 9142077. ^ Crystalline Silica Primer, US Dept of the Interior and US Bureau of Mines, 1992. ^ NIOSH Hazard Review. Health Effects of Occupational Exposure to Respirable Crystalline Silica. DHHS 2002-129. pp. 23. ^ Weisman DN and Banks DE. Silicosis. 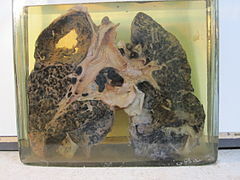 In: Interstitial Lung Disease. 4th ed. London: BC Decker Inc. 2003, pp391. ^ "Guide to Training Your Staff for OSHA Compliance | Industrial Vacuum". www.industrialvacuum.com. Retrieved 2018-10-23. ^ CPWR-The Center for Construction Research and Training. "Work Safely with Silica: methods to control silica exposure". Archived from the original on 2012-12-20. ^ Sahu, Anand P.; Saxena, Ashok K. (October 1994). "Enhanced Translocation of Particles from Lungs by Jaggery". Environmental Health Perspectives. 102 (S5): 211–214. doi:10.2307/3432088. JSTOR 3432088. PMC 1567304. PMID 7882934. ^ Fu, Nai-Fang; Luo, Chang-hui; Wu, Jun-cai; Zheng, Yan-yan; Gan, Yong-jin; Ling, Jian-an; Liang, Heng-qiu; Liang, Dan-yu; Xie, Jing; Chen, Xiao-qin; Li, Xian-jun; Pan, Rui-hui; Chen, Zuo-Xing; Jiang, Sheng-jun (2013). 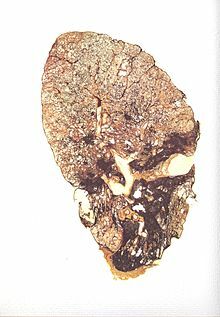 "Clearance of Free Silica in Rat Lungs by Spraying with Chinese Herbal Kombucha". Evidence-Based Complementary and Alternative Medicine. 2013: 1–9. doi:10.1155/2013/790792. PMC 3760100. PMID 24023583. Archived from the original on 2016-08-23. Retrieved 2016-05-28. ^ Chao, D.H.; Ma, J.Y.C. ; Malanga, C.J. ; Banks, D.E. ; Hubbs, A.F. ; Rojanasakul, Y.; Castranova, V.; Ma, J.K.H (July 1996). "Multiple emulsion-mediated enhancement of the therapeutic effect of tetrandrine against silicosis". West Virginia University School of Pharmacy. OSTI 463739. Previously it was shown that the action of tetrandrine is attributed to its ability to inhibit the release of reactive oxygen metabolites and inflammatory cytokines by alveolar macrophages, and that targeted delivery of tetrandrine to alveolar macrophages using a multiple emulsion system minimizes drug toxicity, maintains the drug's pharmacological activity, and enhances tetrandrine distribution in the lungs while reducing systemic drug distribution. This study provides evidence of emulsion-mediated enhancement of drug action in the lungs against silica-induced lung injury using a rat model. ^ Steenland K, Goldsmith DF (November 1995). "Silica exposure and autoimmune diseases". Am. J. Ind. Med. 28 (5): 603–8. doi:10.1002/ajim.4700280505. PMID 8561170. ^ "Safety and Health Topics Silica, Crystalline". Occupational Safety and Health Administration. March 2007. Archived from the original on 2007-05-18. Retrieved 2007-05-29. ^ "Ch. 2: Fatal and Nonfatal Injuries, and Selected Illnesses: Respiratory Diseases: Pneumoconioses: Silicosis". Worker Health Chartbook 2004. National Institute for Occupational Safety and Health (NIOSH). 2004. doi:10.26616/NIOSHPUB2004146. 2004-146. Archived from the original on 2017-11-23. ^ Keenan, Steve (2008-04-02). "Book explores Hawks Nest tunnel history » Local News » The Fayette Tribune, Oak Hill, W.Va". Fayettetribune.com. Archived from the original on 2008-11-25. Retrieved 2012-02-16. ^ Norboo T, Angchuk PT, Yahya M, et al. (May 1991). "Silicosis in a Himalayan village population: role of environmental dust". Thorax. 46 (5): 341–3. doi:10.1136/thx.46.5.341. PMC 463131. PMID 2068689. ^ "NIOSHTIC-2 Publications Search - 20040975 - OSHA/NIOSH hazard alert: worker exposure to silica during hydraulic fracturing". www.cdc.gov. Archived from the original on 2018-03-17. Retrieved 2018-03-16. ^ "Adverse effects of crystalline silica exposure. American Thoracic Society Committee of the Scientific Assembly on Environmental and Occupational Health". Am. J. Respir. Crit. Care Med. 155 (2): 761–8. February 1997. doi:10.1164/ajrccm.155.2.9032226. PMID 9032226. ^ Hawass ND (September 1987). "An association between 'desert lung' and cataract—a new syndrome". Br J Ophthalmol. 71 (9): 694–7. doi:10.1136/bjo.71.9.694. PMC 1041277. PMID 3663563. ^ Nouh MS (1989). "Is the desert lung syndrome (nonoccupational dust pneumoconiosis) a variant of pulmonary alveolar microlithiasis? Report of 4 cases with review of the literature". Respiration. 55 (2): 122–6. doi:10.1159/000195715. PMID 2549601. ^ Korényi-Both AL, Korényi-Both AL, Molnár AC, Fidelus-Gort R (September 1992). "Al Eskan disease: Desert Storm pneumonitis". Mil Med. 157 (9): 452–62. doi:10.1093/milmed/157.9.452. PMID 1333577. ^ Griffin DW (July 2007). "Atmospheric movement of microorganisms in clouds of desert dust and implications for human health". Clin. Microbiol. Rev. 20 (3): 459–77, table of contents. doi:10.1128/CMR.00039-06. PMC 1932751. PMID 17630335. ^ "OSHA publishes final rule on silica". Archived from the original on 2016-08-18. Retrieved 2016-08-18. ^ a b "OSHA's Final Rule to Protect Workers from Exposure to Respirable Crystalline Silica". www.osha.gov. Archived from the original on 2016-08-20. Retrieved 2016-07-22.